As tempting as it was to post yesterday, in respect for all the jingoistic good cheer yesterday, I desisted. What is there to celebrate, pray, tell me? I found all this Happy Independence Day wishes going around jarring. We Indians (and our erstwhile brothers in neighbouring countries) are big on rhetoric and gestures. We like the tamasha of public displays of emotions. Everything is larger than life. Births, deaths, weddings, honour and patriotism. We are corrupt to the very core, and most of us can’t get by even a day without being party to a crime, big or small. Jumping Qs, paying bribes, clamouring for that which we haven’t earned, finding legal loopholes that will make our lives easier… Yes, let’s blame the system, and say that there is no other way to be. But there are people who have made sacrifices, to avoid compromising their principles. People like Anna Hazare, on whose integrity every media-savvy activist wants a piggy-back ride to fame. I am not in total support of Anna Hazare’s current campaign—the civil society should not be ‘in’ power, it should be empowered—but I have nothing but respect for a gentleman of his community service record. Don’t equate your need for drama, desire for limelight and hunger for public applause with patriotism. What are you patriotic about? The language YOU speak? The food YOU eat? The colour of YOUR skin? The culture of YOUR state? The habits of YOUR community? What exactly are YOU ‘Proud’ of, when you say you are PROUD to be an Indian? Is it diversity? Really? Yet we want one community to imbibe the culture of the other—to ‘fit into’ our larger plans. We want one language to be given precedence over the other. We were enraged by the US diplomat’s dark and dirty comment, but isn’t that how most of us see the ‘dark’? Diversity? Ha! We call our countrymen from the North East ‘chinks’ and other derogatory terms (explains why Irom Sharmila’s cause is not a ‘national’ cause), because they don’t look ‘Indian’—how exactly are we supposed to look. Light skin, straight black hair? Dark skin liberally powdered, curly hair brutally straightened? Big kajal-rimmed eyes? What diversity, really? And don’t get me started on the great ‘Tambrahm’ pride that’s all the rage now, thanks to humour blogs and some really smart marketing. How much more casteist can we get—even if it’s clothed in self-evasive humour that talks about the intellectual superiority of a group of people. Similar pride marches are conducted by those from West Bengal and Kerala too! Intelligence is not genetic. It is about opportunities and hardwork, and comes in many forms and manifests itself in different ways. So, we are celebrating our independence from the British, is it? Yet we will prostrate before the white man even today. And we show the scantest respect to those who got us that freedom, spewing pop opinion on leaders about whom we know little or nothing! Am I patriotic? I don’t know… when our soldiers are being killed at the borders I feel morally troubled to buy produce from our neighbours. But that is rhetoric too right? A statement for the sake of it. I support our sporting teams. Is that patriotism? And when people ask me where home is, I don’t think twice before saying India, and then Madras. Is that patriotism? I do get goosebumps when I hear our National Anthem. So? I really am wary of attributing the term Patriotism to these emotions… it’s just a preference, a habit. Ps: Quite poetic that I brought my Independence day non-celebration to a close by watching Aarakshan. Do watch it, a post on that coming up soon. And no, I am not pro-reservation in its current form. Ps2: Yes, I am often called depressingly negative. Though I don’t see myself that way even for a minute. "Save me from the Autograph hunters. They are terrorising me!" Or something on those lines. 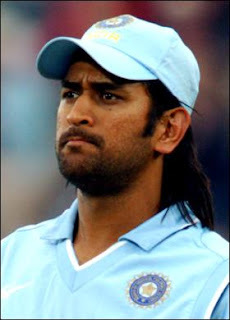 MS Dhoni (whom I LOVE as a captain/cricketer) is not happy with the 2 dozen cops giving him cover. So in these tense times, the cops are going to up HIS security. This is what our country needs!!!!!!!!!!!!!!!!! He has definitely come down a rung or two in my eyes. Keep this up, and you will be hit on the head with the pedestal we have put you on. Maximum deaths were at CST. Maximum coverage was not on it though. Maximum blame will probably be on the cops in the station, because CCTV caught their inaction. Maximum bias, maximum insecurity, maximum snobbery, maximum city. Added: Gnani has said it much better and much more forcefully here.